If you are planning a move, it may be in your best interest to hire one of the best movers Alexandria, VA locals trust. 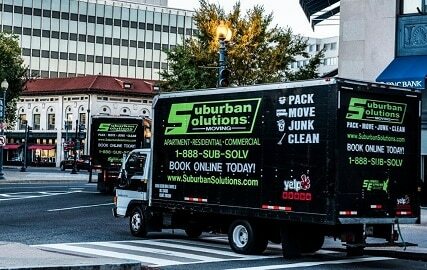 Suburban Solutions has offered moving services in Alexandria for years and has become one of the most reputable moving companies in the area. We strive to make the moving process as easy and stress-free as possible for our customers. Your Belongings Are Safe: If you hire professional movers, you will not have to worry about your precious belongings getting damaged during the moving process. Our movers carefully protect furniture and other items in heavy-duty materials and will treat your belongings with the utmost of care. Your Move May Be Less Stressful: Renting a moving truck, lifting and carrying heavy items, asking family members and friends to help you move can all be very stressful and physically exhausting. If you hire who many consider one of the best movers Alexandria, VA residents respect, we can do all of the legwork, so you can relax and feel less stressed. You Do Not Have to Worry About Injuries: Moving heavy items like furniture can place a lot of strain on your body, especially when carrying them up and down staircases. It can also result in one or more serious injuries. Our professional movers have training, experience, and are physically capable of hauling heavy belongings. With our help, you can avoid doing the physical labor and potentially hurting yourself. The Move May Be Quicker: If you do not have any professional moving experience, it may take a lot of time for you to move your belongings to your new home. A professional and one of the best movers Alexandria, VA locals rely on like Suburban Solutions has moved many people and knows how to move large numbers of items quickly and efficiently. With skilled movers on your side, you may get your items moved in less time which means you can get on with your regular daily routine much sooner. Professional Movers Are Reliable: Even if your family members or friends tell you that they will help you move, you never know if they will back out at the last minute. With professional movers, you do not have to worry about. We are reliable and will be there on time to help you move. You May Save Money: While hiring Alexandria, VA movers will cost money, it may actually help you save money in the long run. For example, the best movers Alexandria VA residents depend on should know how to handle fragile items so that they don’t break. If you let them take care of your items, you won’t have to worry about purchasing replacements later on. In addition, with our help you can avoid taking precious time off from work that you can’t afford. If you are looking for one of the best movers Alexandria, VA offers, consider calling Suburban Solutions at 917-697-4555.